The first federal wine stamps appeared in 1914, being the result of the Emergency Revenue Act of October 22, 1914. 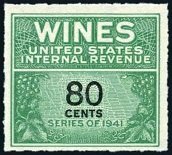 Among other things, the new tax law increased the federal excise tax on wine, which was to be collected through the use of new revenue stamps. All of the wine revenue stamps are somewhat similar in appearance. The stamps were printed on watermarked paper, in shades of green, and most of the sheets featured roulette separation. Throughout the lifetime of this series, only seven major design types were produced, yet MANY denominations exist for each of them. For brevity, only one example of each of the major design types will be shown in the images on this page. 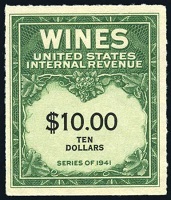 Smaller-format wine stamps were issued between 1941 and 1951. An example is shown above. These wine stamps are rouletted 7, and they are all inscribed "SERIES OF 1941". 00 1/5 C. (1942 - Sc. #RE108) - Green & Black. 00 1/2 C. (1942 - Sc. #RE110) - Green & Black. 01 C. (1942 - Sc. #RE111) - Green & Black. 01 7/10 C. (1951 - Sc. #RE182D) - Green & Black. 02 C. (1942 - Sc. #RE112) - Green & Black. 03 C. (1942 - Sc. #RE113) - Green & Black. 03 2/5 C. (1951 - Sc. #RE114) - Green & Black. 03 1/2 C. (1942 - Sc. #RE114) - Green & Black. 04 C. (1942 - Sc. #RE116) - Green & Black. 05 C. (1942 - Sc. #RE117) - Green & Black. 06 C. (1942 - Sc. #RE118) - Green & Black. 07 C. (1942 - Sc. #RE119) - Green & Black. 07 1/2 C. (1942 - Sc. #RE120) - Green & Black. 08 C. (1942 - Sc. #RE121) - Green & Black. 08 1/2 C. (1951 - Sc. #RE184) - Green & Black. 09 C. (1942 - Sc. #RE122) - Green & Black. 10 C. (1942 - Sc. #RE123) - Green & Black. 11 1/4 C. (1942 - Sc. #RE124) - Green & Black. 12 C. (1942 - Sc. #RE125) - Green & Black. 13 2/5 C. (1951 - Sc. #RE185) - Green & Black. 14 C. (1942 - Sc. #RE126) - Green & Black. 16 C. (1942 - Sc. #RE128) - Green & Black. 17 C. (1951 - Sc. #RE186) - Green & Black. 19 1/5 C. (1942 - Sc. #RE129) - Green & Black. 20 C. (1942 - Sc. #RE130) - Green & Black. 20 2/5 C. (1951 - Sc. #RE187) - Green & Black. 24 C. (1942 - Sc. #RE131) - Green & Black. 28 C. (1942 - Sc. #RE132) - Green & Black. 32 C. (1942 - Sc. #RE134) - Green & Black. 33 1/2 C. (1951 - Sc. #RE188) - Green & Black. 36 C. (1942 - Sc. #RE135) - Green & Black. 38 1/4 C. (1951 - Sc. #RE189) - Green & Black. 40 4/5 C. (1951 - Sc. #RE190) - Green & Black. 45 C. (1942 - Sc. #RE137) - Green & Black. 48 C. (1942 - Sc. #RE138) - Green & Black. 50 C. (1942 - Sc. #RE139) - Green & Black. 51 C. (1951 - Sc. #RE191) - Green & Black. 60 C. (1942 - Sc. #RE140) - Green & Black. 67 C. (1951 - Sc. #RE192) - Green & Black. 68 C. (1951 - Sc. #RE193) - Green & Black. 72 C. (1942 - Sc. #RE141) - Green & Black. 80 C. (1942 - Sc. #RE142) - Green & Black. 80 2/5 C. (1951 - Sc. #RE194) - Green & Black. 84 C. (1942 - Sc. #RE143) - Green & Black. 90 C. (1942 - Sc. #RE144) - Green & Black. 96 C. (1942 - Sc. #RE145) - Green & Black. Large-format wine stamps were also issued between 1942 and 1953. An example is shown above. These wine stamps are rouletted 7, and they are all inscribed "SERIES OF 1941". A couple examples are shown above. 0001.20 D. (1942 - Sc. #RE146) - Yellow Green & Black. 0001.44 D. (1942 - Sc. #RE147) - Yellow Green & Black. 0001.50 D. (1942 - Sc. #RE148) - Yellow Green & Black. 0001.50 3/4 D. (1951 - Sc. #RE195) - Yellow Green & Black. 0001.60 D. (1942 - Sc. #RE149) - Yellow Green & Black. 0001.60 4/5 D. (1951 - Sm. Letters - Type 1 - Sc. #RE196) - Yellow Green & Black. 0001.60 4/5 D. (1951 - Sm. Letters - Type 2 - Sc. #RE196c) - Yellow Green & Black. 0001.60 4/5 D. (1953 - Lg. Letters - Type 1 - Sc. #RE198b) - Yellow Green & Black. 0001.60 4/5 D. (1953 - Lg. Letters - Type 2 - Sc. #RE198) - Yellow Green & Black. 0001.68 D. (1942 - Sc. #RE150) - Yellow Green & Black. 0001.80 D. (1942 - Sc. #RE151) - Yellow Green & Black. 0001.88 3/10 D. (1951 - Sc. #RE197) - Yellow Green & Black. 0001.92 D. (1942 - Sc. #RE152) - Yellow Green & Black. 0002.01 D. (1953 - Sc. #RE199) - Yellow Green & Black. 0002.40 D. (1942 - Sc. #RE153) - Yellow Green & Black. 0002.68 D. (1951 - Sc. #RE200) - Yellow Green & Black. 0003.00 D. (1942 - Sc. #RE154) - Yellow Green & Black. 0003.36 D. (1942 - Sc. #RE155) - Yellow Green & Black. 0003.60 D. (1942 - Sc. #RE156) - Yellow Green & Black. 0004.00 D. (1942 - Sc. #RE157) - Yellow Green & Black. 0004.08 D. (1951 - Sc. #RE201) - Yellow Green & Black. 0004.80 D. (1942 - Sc. #RE158) - Yellow Green & Black. 0005.00 D. (1942 - Sc. #RE159) - Yellow Green & Black. 0005.76 D. (1951 - Sc. #RE202) - Yellow Green & Black. 0007.20 D. (1942 - Sc. #RE160) - Yellow Green & Black. 0008.16 D. (1951 - Sc. #RE203) - Yellow Green & Black. 0009.60 D. (1951 - Sc. #RE204) - Yellow Green & Black. 0010.00 D. (1942 - Sc. #RE161) - Yellow Green & Black. 0020.00 D. (1942 - Sc. #RE162) - Yellow Green & Black. 0050.00 D. (1942 - Sc. #RE163) - Yellow Green & Black. 0100.00 D. (1942 - Sc. #RE164) - Yellow Green & Black. 0200.00 D. (1942 - Sc. #RE165) - Yellow Green & Black. 0400.00 D. (1942 - Sc. #RE165B) - Yellow Green & Black. 0500.00 D. (1942 - Sc. #RE166) - Yellow Green & Black. 0600.00 D. (1942 - Sc. #RE167) - Yellow Green & Black. 0900.00 D. (1942 - Sc. #RE168) - Yellow Green & Black. 1000.00 D. (1942 - Sc. #RE169) - Yellow Green & Black. 2000.00 D. (1942 - Sc. #RE170) - Yellow Green & Black. 3000.00 D. (1942 - Sc. #RE171) - Yellow Green & Black. 4000.00 D. (1942 - Sc. #RE172) - Yellow Green & Black. 0001.00 D. (1949 - Sc. #RE173) - Yellow Green & Black. 0002.00 D. (1949 - Sc. #RE174) - Yellow Green & Black. 0004.00 D. (1949 - Sc. #RE175) - Yellow Green & Black. 0005.00 D. (1949 - Sc. #RE176) - Yellow Green & Black. 0006.00 D. (1949 - Sc. #RE177) - Yellow Green & Black. 0007.00 D. (1949 - Sc. #RE178) - Yellow Green & Black. 0008.00 D. (1949 - Sc. #RE179) - Yellow Green & Black. 0010.00 D. (1949 - Sc. #RE180) - Yellow Green & Black. 0020.00 D. (1949 - Sc. #RE181) - Yellow Green & Black. 0030.00 D. (1949 - Sc. #RE182) - Yellow Green & Black. 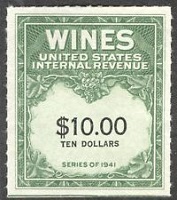 Wine revenue stamps were discontinued on December 31, 1954. "other denominations of engraved stamps that were printed and delivered to the Internal Revenue Service were: $7.14, $9, $12, $40, $60, $70, $80, $300, $700, and $800. None are reported in collectors' hands". Yet, I have seen the stamps shown in the table below for sale on the internet recently. I would appreciate it, if anyone could provide further information on these wine stamps, and exactly where they would fit into the logical review sequence of this page. 0007.14 D. (???? - Sc. #RE159A) - Yellow Green & Black. 0009.00 D. (???? - Sc. #RE182A) - Yellow Green & Black. 0012.00 D. (???? - Sc. #RE180A) - Yellow Green & Black. 0060.00 D. (???? - Sc. #RE182B) - Yellow Green & Black. 0070.00 D. (???? - Sc. #RE182C) - Yellow Green & Black. 0080.00 D. (???? - Sc. #RE182D) - Yellow Green & Black. 0700.00 D. (???? - Sc. #RE167A) - Yellow Green & Black. 0800.00 D. (???? - Sc. #RE167B) - Yellow Green & Black.